What Goes into the Shaimos Bag? “The Yated has numerous, excellent weekly columns that deal with halacha issues. I want to suggest a topic that I, and probably many others as well, would like to see clarified. The topic is sheimos. “Among the questions I have on the subject are: What items constitute sheimos? What is the halacha concerning books containing words of Torah written by people who reject Torah? May I discard the booklets the children bring home from school or a newspaper that contains Torah articles into the regular trash? Does it make a difference if the item was produced knowing it would soon be disposed? May wedding invitations contain pesukim? Indeed, in our time there is a huge proliferation of printed divrei Torah. Are we required to place all of these items in sheimos? As always, it is not the purpose of our column to determine the halacha for our readers; each person should refer his/her own shaylos to one’s rav. Our purpose here is to introduce the subject and the issues involved. In Parshas Re’eih, the Torah commands: Destroy all the places where the gentiles that you are driving out worshipped their gods, whether they were on high mountains or on hills, or beneath any leafy tree. Raze their altars, smash their pillars, burn their idolatrous asheirah trees, and demolish the images of their gods. Obliterate the names (of their deities) from that place. Do not do this to Hashem your G-d!” (Devarim 12:2-4) This last verse teaches that, just as it is a mitzvah min haTorah to destroy idols and everything associated with them, so too it is a Torah violation to destroy anything containing Hashem’s name (Shabbos 120b; Rambam, Hil. Yesodei HaTorah 6:1). When the Torah states: Obliterate the names (of their deities) from that place. Do not do this to Hashem your G-d, it prohibits erasing or obliterating something containing one of Hashem’s holy names, specifically referring to the seven sheimos she’einam nimchakim, the seven names of Hashem that may never be erased (Shavuos 35a). These names are the names of Hashem that we are careful not to pronounce except when reciting a prayer, but instead modify their pronunciation; for example, we say Elokim, Hashem, or Keil. When an item containing one of these names can no longer be used, it must be treated in a very special way, as we will see shortly. As an extension of this prohibition, Chazal prohibited destroying other holy writings, including commentaries, halacha, and other Torah works (see Rambam, Hil. Yesodei HaTorah 6:8). The precise details of how to dispose of these items are sometimes disputed. In Yiddish, holy items that require halachically-approved disposal are called sheimos, a truncating of the phrase sheimos she’einam nimchakim, names that may never be erased. The customary Hebrew word used in this context, genizah, means the place where these items are placed. Thus, one term describes the basis for the sanctity of these items, whereas the other depicts their treatment. To maintain the connotations and uses of both terms, I will use the word “sheimos” to refer to the items themselves that have sanctity and the word “genizah” to describe how these items are handled when no longer usable. One may not erase the seven sheimos she’einam nimchakim even to repair a sefer torah. For example, if a sofer errantly wrote one of these names in a place where it does not belong, one may not simply erase the name to render the sefer torah kosher. Instead, some opinions allow one to surgically split the thickness of the parchment on which he wrote the holy name in a way that removes the holy name intact. This is an extremely delicate task since one must remove the complete intact name no matter how deeply its ink has seeped into the parchment. This piece of parchment containing the holy name must now be placed in genizah. In order to write on the parchment where this name was located, the sofer sands it to restore its texture. What is the proper way to perform genizah? Worn out sifrei torah should be placed in earthenware vessels and then buried (Megillah 26b). Placing them inside these vessels forestalls the decomposition of the sifrei torah for a long time. Indeed it is a tragedy that Hashem’s name becomes obliterated, even in an indirect way, and the mitzvah commands us to delay their decay for as long as possible. They should be buried near a talmid chacham, or at least near someone who studied halacha and other basic Torah. 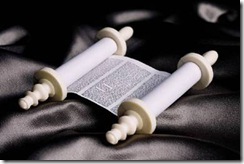 Do printed seforim require the same standards of genizah that the Gemara requires for a sefer torah? The poskim dispute whether printed seforim also need to be protected in earthenware vessels before they are buried. The Be’er Sheva requires them to be buried inside earthenware vessels, as does the Keneses Yechezkel (Shu”t Be’er Sheva #43, quoted by Magen Avraham 154:9 and Shu”t Shvus Yaakov 3:10; Shu”t Keneses Yechezkel #37, quoted by Rav Shlomoh Eiger in his notes to Yoreh Deah 282:10). The Keneses Yechezkel adds that packing them inside wood boxes is as acceptable as burying the sheimos in earthenware. Both of these authors rule that printed seforim must be packed properly before burial, even those without Hashem’s name. On the other hand, the Pri Megadim (commenting on this Magen Avraham) notes that the custom is to bury worn-out printed seforim without placing them inside vessels, and to insist on this special treatment only for hand-written nevi’im and kesuvim (used contemporarily predominantly for haftarah and megillos) that are written on parchment. Thus we see that there is a dispute whether printed seforim must be packed in earthenware or other similarly protective ways before burial; the Be’er Sheva and Keneses Yechezkel requiring it, and the Pri Megadim not. What is the accepted halachic practice? The Mishnah Berurah (154:22, 24) quotes only the Pri Megadim, accepting that printed seforim, even those bearing Hashem’s name, do not have the full level of sanctity of hand-written seforim; he does not even mention the disputing opinions. My impression is that this is the practice usually followed by those who bury genizah: hand-written Sifrei Torah, mezuzos, tefillin, megillos and naviim are specially packed before burial in earthenware, wood, or glass containers; whereas worn-out, printed seforim are simply placed in bags or cardboard boxes and buried. Despite the serious transgression of destroying Hashem’s name, names written by a Jew who rejects Torah belief have no sanctity min haTorah (Rambam, Hil. Yesodei HaTorah 6:8). If the texts including these names were written by such a Jew, or if the text contains sacrilegious or heretical ideas or references, one should destroy them (see Shabbos 116a; Gittin 45b). Torah writings authored by a gentile that contain no heretical beliefs should be placed in genizah (Gittin 45b; Rambam, Hil. Yesodei HaTorah 6:8). Those that contain heresy should be destroyed. Destroying Torah writings that do not include Hashem’s name is prohibited mi’derabbanan (see Rambam, Hil. Yesodei HaTorah 6:8, based on Shabbos 115, 116). Thus, Mishnayos, Gemaras, and most parts of commentaries on Tanach, Gemara, Halacha and Aggadah are considered sheimos only mi’derabbanan since it is unusual to find Hashem’s names in them. Reference notes that are incomprehensible on their own are not considered divrei torah and may be placed in the regular garbage (Shu”t Igros Moshe, Yoreh Deah 2:75). Some halachic authorities maintain that if a printer or writer did not intend to produce seforim or divrei kedusha, then the resultant product has no kedusha (Shu”t Ein Yitzchak 5:7-9; Chazon Ish, Yoreh Deah 164:3 s.v. ve’im; see also Shu”t Igros Moshe, Yoreh Deah 1:172). According to this approach, a book published on a non-Torah subject that includes some divrei torah need not be placed in genizah when it wears out. This lenience applies only to items that do not contain one of the seven names of Hashem (Shu”t Meishiv Davar 2:80). If a newspaper or magazine contains divrei torah, does this require it to ultimately be placed in genizah? Based on much of the above-discussion, the Melameid Liho’il (2:89) rules that non-Hebrew publications containing Hashem’s name may even be respectfully burnt. He contends that since the printer did not realize he was printing anything holy, the magazine has no kedusha. There is therefore no requirement to dispose of these items in genizah. He does insist that they not be treated disdainfully, and in his opinion, burning these publications, so as not to treat them as regular garbage, constitutes treating them with adequate respect. Can we make the same assumption concerning a frum Hebrew newspaper? Does the printer think that there is no kedusha in what he is printing? Or, should we assume that since most frum newspapers contain some divrei torah, the printer realizes that he is printing divrei torah; thus, those parts of the newspaper or magazine should be placed in genizah. The written opinions I have seen on this subject vary. Most contemporary poskim rule that one is not required to put a newspaper containing divrei torah into genizah; it is satisfactory to wrap the paper or simply the divrei torah before disposing of them in the garbage (Rav Elyashiv and Rav Vozner, quoted in Ginzei HaKodesh pgs. 154, 236). This approach accepts that these divrei torah were printed without intent to make them holy. However, they should be wrapped first so that they are not treated with disdain. A minority opinion contends that one must place the divrei torah sections of these newspapers in genizah (Ginzei HaKodesh pg. 154, quoting Rav Nissim Karelitz). I have noticed that some chareidi newspapers in Israel print a note on the page when there is a dvar torah on the page, calling the reader’s attention to the fact that this page requires genizah. Apparently, these publications follow the stricter of the rulings cited above. Several earlier authorities imply that divrei torah intended to be temporary do not have kedusha (see Shu”t Ayn Yitzchak #5:7; Shu”t Meishiv Davar 2:80). The line of reasoning here is that since the printer does intend to create permanent Torah works, the items do not become holy. This approach explains the common practice of photocopying Torah quotations for one time use without exerting major effort to retrieve the items for genizah. I leave it to the reader to discuss with his rav whether he may follow this approach. Two different halachic concerns are involved when one prints a pasuk or statement of Chazal on an invitation. The first issue is that many people will not realize that this invitation may not be disposed in the garbage, a contemptuous finale for holy writings. (Although the printer may not intend to print this for holy purposes, this only permits not placing the invitations in genizah. As I mentioned above, they may not be placed directly in the regular garbage.) Thus, the person ordering the printing of these works is guilty of causing the destruction of holy writings. A second halachic concern is that one is only permitted to create written Torah works in order to learn Torah, but not as a decoration. (This is a lengthy subject that I discussed in an article published several years ago.) Thus, a decorative, non-educational use of pesukim or maamarei Chazal violates the halacha. HOW MUCH OF A PASUK IS CONSIDERED TO BE DIVREI TORAH? Granted that writing a pasuk on an invitation will make the invitation into sheimos, how much of a pasuk requires genizah? In a different context the Gemara rules that even three consecutive words of a pasuk should be treated as holy writings (Gittin 6b). Although people are fond of quoting or paraphrasing scriptural blessings or prayers in an invitation, we see that one may not use parts of pesukim or statements of Chazal for this purpose. However, there is a simple solution to this desire: one may paraphrase a pasuk on the invitation in a way that it is no longer considered holy writings. 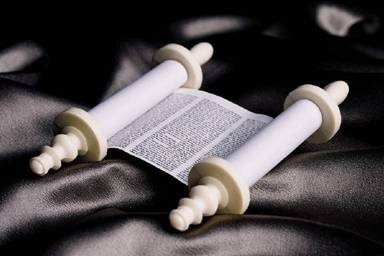 Take, for example, the announcement: Naaleh es Yerushalayim al rosh simchaseinu, “We will place our memories of Yerushalayim above our celebrations.” Although this quote is reminiscent of Tehillim 137:5, it is not an exact quotation, nor does it contain three consecutive Scriptural words. Similarly, one may print on an invitation, Yom zeh asah Hashem nismecha v’nagila bo, “This day was made by Hashem. We shall rejoice and celebrate on it.” Although very similar to the pasuk we recite as part of Hallel, Zeh hayom asah Hashem nagilah v’nismecha bo (Tehillim 118:24) the words of the original pasuk have been transposed so that there are no longer three consecutive words from the original! Similar concerns to those regarding wedding invitations may apply sukkah decorations bearing verses and statements of Chazal, notwithstanding their proliferation. Some authorities feel that since the decorations are intended to last for more than one year, there is a reason here to be lenient. Those who follow the stricter approach should utilize the same advice given above concerning pesukim on invitations: Do not quote three consecutive words of a pasuk in a straight line. Again, I refer the question to your own rav. Thousands of pages of Torah rattle off presses and home and business printers every day, spreading Torah to every corner of the globe. By disposing of this material appropriately, we help ensure that this glory of Torah does not lead to its desecration.